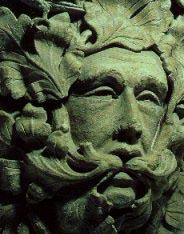 The Green Brother is a reference to the Green Man motif that you can see in Northern European churches and buildings particularly in England. It is thought to be a surviving pagan motif that was transplanted into Christianity. Given the symbolism it is probably has to do more with spring then summer. Edit: The problem with summer is that for most of human history summer was the season of work. The vast majority of agricultural work was done during the summer months. It was the most boring season as Spring was the season where things began to grow again and represented the ending of winter starvation. Fall was the harvest and slaughter. It was the time where half a years work payed off. It was time for celebration. Winter of course was the starving times where there was no fresh food available and you had to depend on your stores. Hollywood would call it the Rise of the Guardians but really, it was much more complicated then a creature of darkness feeling petty due to a lack of belief. The Dark Undermaster had shattered the balance of power in Otherworld for one thing and almost all of it was now under the control of the Unseelie Court, save for pockets of resistance like Avalon and Oz. For another the Entropic Master known as Dagon had somehow found his way into Otherworld and he sought to corrupt it just as his minions sought to corrupt the Earth. Given Otherworld's ties to the Imageria that would surely spell disaster for the entire Multiverse. However Androcles the Lion knew that that was just the tip of the iceberg. Orkus always had designs upon Otherworld and he'd already seen dire portents of a threat yet to come. A threat that somehow involved the Dark Lady who'd tried to corrupt the Clarke Siblings and who'd modelled her realm to mock his own. Even with his good friend Erich Weiss on his side, the lion knew that he couldn't handle these threats on his own and keep an eye on both the Masterson Twins AND the Clarke Siblings. The two of them would need allies. Fortunately for Mr. Fuzzy, Santa Claus and the Easter Bunny had already been battling against the Dark Undermaster's forces and were more then happy to assist. Though he rarely got involved in it's politics Santa Claus was a lord of the Winter Court, having been named the heir of Old Man Winter before that worthy was assassinated in a court intrigue and he'd already been using his sleigh to ferry refuges out of the Undermasters realm to places they would be safe. There had been more then a few skirmishes between him and the Undermasters forces already and since the goblins who'd often assaulted his toy shop in the past had sworn fealty to the Dark Undermaster, Santa was only too happy to offer the services of himself, his elves and anybody else who stood by his cause toward the defence of Otherworld. Through him the refugees known as Tatterhood and Puss in Boots were recruited, both of them having lost people close to them as a result of the Dark Undermaster and both seeking revenge. The Easter Bunny on the other hand was a Pooka and had fought the Undermaster's forces alongside his people and wasn't about to stop simply because his people had been scattered across Otherworld. Being a noble being at heart, Peter Cottontail was only too happy to join the cause when he discovered there were greater concerns then just the Dark Undermaster. The last recruits showed up during the first meeting of the team. Already looking after the Clarke Siblings at the request of Adrian Eldritch, the Fairy Godmother and her good friend the Tooth Fairy showed up to warn the team about an upcoming assault on Santa's home lead by the Dark Undermaster and backed by the Parliment of Shadows. Thus began the Third Great Battle of Christmastown. Alrighty, I've received Threat Report and the Supernatural Handbook on Friday and I just finished reading Threat Report today. I'm starting Supernatural Handbook today and when I'm done I'll start getting to work on adding the material from those books into the Mightyverse. Also, I'm planning on adding the various dimensional empires mentioned in Age of Wonders to the Mightyverse to make things more interesting. I'll be interested in seeing how you put all these disparate elements together Mighty Davidson! Naturally the main Earth of the Mightyverse, let's call it Earth M for now shall we, is not alone in the multiverse. As many a superhero has discovered there are quite a few alternate Earths and many other worlds in existence and just as powerful nations would form empires by conquering other nations, so to are megaversal empires formed by one world conquering other worlds. The largest of these of course are the empire of Una the Unspeakable, Orkus' Dark Crusade and the collection of worlds held by the One Above All. Una and Orkus' domains have been in a state of cold war ever since Una's forces used Orkus' invasion of the Earth as an opportunity to attack and seize several worlds from the Crusade of Darkness. In fact were it not for the One Above All the two would already be at war but both rulers know they cannot fight each other without first eliminating the One Above All, since the moment they stop paying attention to it is the moment the One Above All starts subverting the citizens of their domains. What really worries Una however, is that Orkus might have the ability to subvert the One Above All. Quasimodo has proven capable of bringing sentient technology under his control before so who is to say he can't do that to the One Above All? Through various agents she's made the Cosmic Order of Wizards aware of the situation and though they are aware that Una is the one who ultimately revealed the information to them, they cannot possibly ignore the possibility of Orkus seizing control of a force as powerful as the OAA. The Grand Republic: Aside from the One Above All, the Grand Republic has been the most dire enemy of Una and Orkus in the multiverse. Numerous times the Grand Republic has been attacked by Una or the Crusade of Darkness and The Leigon Galactic has proven capable of repelling them almost every time. On the occassions where worlds defended by the Legion Galactic have fallen, it's always been a phyrric victory for the aggressors. Of course the Grand Republic has yet to succeed in bringing liberty to the conquered peoples of either Empire. Despite this, Una has agents attempting to start a war between the Crusade of Darkness and the Grand Republic since such a conflict would very likely drain the resources of two of her toughest enemies. The Sovious Empire: Though they think of themselves as a great empire, the truth of the matter is that only the Star Kingdom of Camelot is really concerned about them. After all the Sovious have lost several fleets in failed attempts to conquer an alternate Earth, one who's inhabitants refer to as Earth 0, that's only recently gained superpowered individuals. Point of fact Una and Orkus are more interested in Earth 0 then the Sovious. However, Una is starting to find it neccesary to conquer or even obliterate them as their plot to cause the Grand Republic to invade Earth 0 is interfering with her own plan to sic the Grand Republic on the Crusade of Darkness. As for Orkus, he thinks the Sovious might make good shock troops for the Crusade of Darkness. The Star Kingdom of Camelot: Not highly regarded by either Una or Orkus either, though they're considered to be more dangerous then the Sovious at least. Their overconfidence will likely proove their downfall however, given the way they're recklessly picking fights with the One Above All. However the apparent alliance with Earth 0 has both of them intriguied, since this is yet another empire that Earth 0 has gotten involved with in the short time super powers have existed on that world. That they have interdimensional travel at all is considered to be quite surprising. Quite a lot of potential for horrible, horrible amounts of chaos and carnage in the multiverse, should any of the Powers collide AGAIN - which sounds about right, given the range of personalities at the head of those various factions that bestride the Cosmic Coil! And such a collision will happen. Una and Orkus may be playing it cautiously as they jockey for position and seek an advantage over the other but once Ares gets going, all of that is going to end. It'll be a four way conflict between Una's Empire, the Crusade of Darkness, Ares and the One Over All. Possibly a five way conflict if the Dark Crusade is battling the Grand Republic when it happens. Could even go to a six way conflict when Dagon discovers Orkus isn't willing to free Cthulu and hooks up with Morgoth to get revenge. It could possibly get worse too if, for example, The Octagon manages to contact The Crime League from Earth M or the Tyranny League from Earth Gestalt or the Syndicate from Earth Paragon or Lex Luthor from the DC Universe and sets up some cross universe supervillain alliance. Worst case scenario: The Octagon manages to contact ALL of the previous mentioned villains and does that. ... I knew that expanding on those jerks would come back to haunt me and LO! there's the rattle of chains accompanying something that goes bump in the night; one can only hope that the likes of Doctor Tomorrow can work something out on the other side of the moral spectrum. Libra wrote: ... I knew that expanding on those jerks would come back to haunt me and LO! there's the rattle of chains accompanying something that goes bump in the night; one can only hope that the likes of Doctor Tomorrow can work something out on the other side of the moral spectrum. Celestial Order of Wizards actually. Doctor Tomorrow is busy helping the Temporal Security Agency protect the timeline. I'll have more comments coming up. The very mention of the place sent a shudder through the bodies of the assembled wizards. A world darker and more vile then even the most cynical of deconstructionist comic writers couldn't think up. A world that even the most virtuous of their number consider pure evil and irredeemable and the only world in the Megaverse who's destruction has been discussed not because it was imperilled by something the Cosmic Order couldn't stop but simply because it existed. On this day they would regret not doing so, because something they'd long feared had just happened: The Crusade of Darkness had discovered Earth 92. Within a day it was part of Orkus' empire but not because it had been quickly conquered. Indeed the inhabitants of Earth 92 had become so vile and corrupt that they welcomed the forces of Orkus into their world as if he was a brother and willingly subjugated themselves to him. Millions of the worlds greatest scientists began assisting Quasimodo in making war machines for the Crusade of Darkness, entire armies of people and metahumans flocked to the Crusade's armies, as Earth 92's infrastructure was altered to feul Orkus' war effort. They did not just bow to evil, they passionately embraced it and jumped at the chance to become more evil. It was the Dark World that the Witches of the Fallen World had warned them about in ancient prophecies. A world eager to doom everything to darkness, because they thought it would be fun.